..Shop Payback Analysis. SDS Features & Benefits .Info. .Videos. .FAQs..
UniVest® by UniTherm is a removable/reusable insulation jacket that can help improve your facilities in variety of ways and will pay itself back in no time. Almost any type of manufacturing facility that uses high temperature processes is a potential UniVest® customer. UniVest® insulation jackets provide a low-cost solution for reducing energy costs, and shortening start-up time between jobs by retaining heat inside barrels, extruders, dies and hoses. This will lower the ambient temperature in your facility, and lower the overhead cost for equipment operations and air conditioning. UniVest® delivers increased control of process temperature to enhance production capacity, reducing the amount of energy needed to keep equipment running at high temperatures. UniVest® also creates a safer work environment for your employees and increases equipment lifespan by protecting key components from high temperatures. Theses collective advantages of UniVest®, allow you to save on energy costs while reducing your organization’s overall carbon footprint. Custom molders usually assume they cannot use insulation jackets because they change process temperatures throughout the day. QuickCool® makes process changes quick and easy. QuickCool® is a custom engineered insulation blanket that increases energy efficiency by holding heat in, but quickly and easily opens up to provide quick cool-down time for the next process. 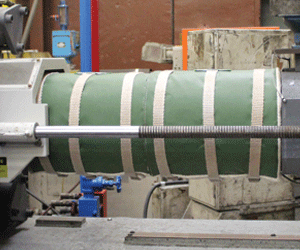 Q: Will adding a UniVest® to my injection molding heater bands cause any problems? A: No, using UniVest®, in conjunction with your heater bands and controller, will actually allow your equipment to operate more efficiently and effectively than before. Q: When I first installed a UniVest® insulation jacket on my machine it gave off smoke when I powered it up. Is this a cause for concern? A: The insulation materials used to manufacture the UniVest® jacket contains organic materials that will burn off with the initial startup. Once the machine is up to the correct temperature the smoke will stop. Q: Once I install UniVest®, how hot will the outside of the blanket be, and will it be “touch safe”? A: Our product meets the OSHA touch safe temperature of 120°F. The UniVest® product line meets OSHA’s touch safe temperature requirements.